Located in Clifton Village, the Wallfish Bistro hides in plain sight; a minuscule establishment boasting tranquillity and civility, while remaining within the WiFi signal of the explosively busy White Lion. Keith Floyd (a man who previously worked within its walls) is honoured with a plaque outside, and that name has an uncanny ability to cast substantial shadows. That's superficial, though; the proper way to pay tribute to Floyd is by cooking up a storm. Mercifully, we're in good hands. Chef Seldon Curry cut his teeth with Mark Hix, and it shows. After knocking back a couple of oysters I am too greedy to resist, I order the wallfish that gives the venue its name. Unlike some snails I have eaten in supposedly high quality restaurants, I taste the earthiness without the mud, and the garlic butter is correctly unembellished upon. It rekindles my desire to have a hunt around my garden in search of their cousins. Two of my companions opt for the mussels in cider, and promptly rave about them. After acquiring a couple for myself, I see why: the huge glut of bay leaves in the sauce has infused the plump bivalves with what I can only describe as 'ultra-musselness'. I can't believe I haven't seen this idea before, but can guarantee I will see it again in my own kitchen. The fourth choice is the crab, which comes dressed and served atop crisp toast with shelled broad beans. The verdict is that the dish is a pleasant one, but I can tell the eater is now longing for the moules on the other side of the table. Sticking with fruits of the sea, my girlfriend orders the hake; her brother goes for the lobster; and his wife, the Gilt-head bream. The hake arrives with crisp skin, the meat is both firm and moist- not an easy task. A rock-pool's worth of clams sit alongside, while samphire weaves the components together with savoury greenery. A whole lobster is available from the menu but, this time, it's the half-shell that's chosen (the plus-30 quid price tag being somewhat of a deterrent). Ladled with glistening butter, the meat beneath is bulging and sweet. I'm also pleased to find out that it's been ordered by a lobster-neophyte; it's always unfortunate when someone braves this symbol of decadence for the first time and bites down on burnt butter and soft rubber. No such disasters here. I have it on good authority that the gilthead sea bream's flesh flaked elegantly from the bones (the abundant bones, though, it must be said), further confirming that these folk really know what they're doing with a piece of fish. Lemon and rosemary offer a fragrant counterpart, while avoiding total dominance. My own course of the whole Dorset crab with mayonnaise is not a particularly easy one to discuss in depth; it's a crab on a plate. However, since plainly cooked brown crabmeat is the finest tasting thing in the known cosmos, what was I supposed to ask for? I must also say a word about the duck fat chips (one of the two sides we ordered): delicious. Perfectly sized, gooey inside, epically crunchy. They push me even further towards a, perhaps insane, view that a chip not fried in duck fat is not really a chip. Having an under-evolved sweet tooth, I dodge dessert in favour of a bottle of Bristol Hop from the Bristol Beer Factory. I steal spoonfuls of solid sweetness from my co-diners, though, and the unanimous opinion is that the ginger cake is the star of the show. The spark of ginger breezes through each bite, before being swamped with sticky sauce: very pleasing indeed. The gooseberry tart offers a welcome sharpness, but the crumble topping is a little grainy for my taste; almost as if the sugar hasn't quite assimilated into the buttery flour. The dark chocolate mousse is rather more up my street; deeply rich, and aided by the glory that is salted caramel. After three courses, and more, one is always going to feel full. It's much rarer, however, to feel satisfied. With good service and truly good food, Wallfish Bistro is a place that delivers satisfaction in spades. You get what you pay for, and you don't pay for anything you don't get. The meal mentioned within the review; Dinner for four, plus wine and service cost £176. 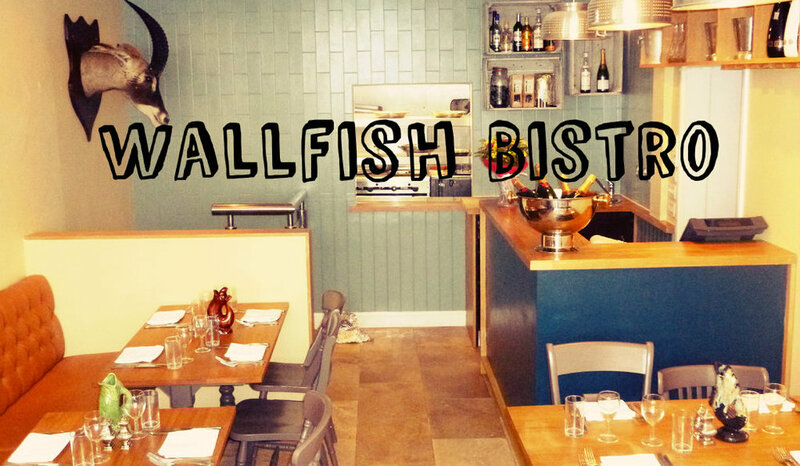 For more information and for an example menu, head over to the Wallfish Bistro website.